SALINA — The Catholics of northwest Kansas greeted their own “apostolic witness” on Aug. 22 as Bishop Gerald “Jerry” L. Vincke was ordained and installed as the 12th bishop of the Diocese of Salina. 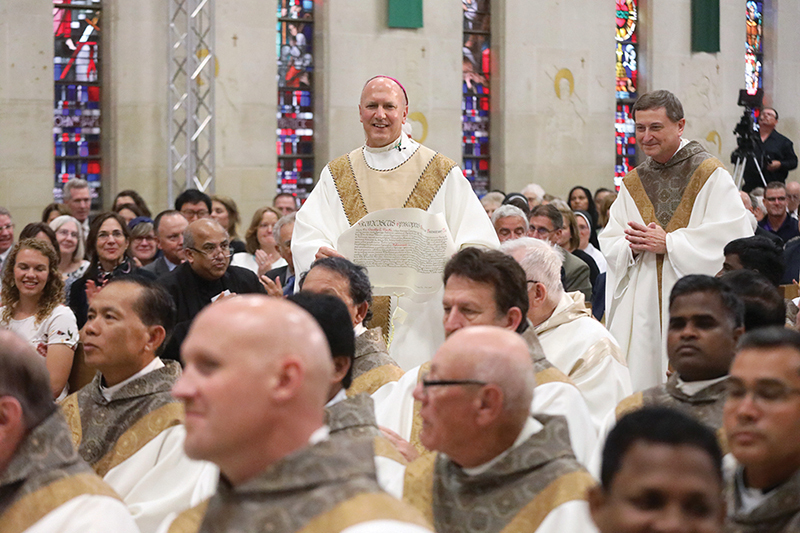 Bishop Vincke was ordained before an overflowing crowd at Sacred Heart Cathedral. The Mass was also live streamed via the diocesan website to faithful across the diocese, and to his home diocese of Lansing, Michigan. The Mass began with the reading of the apostolic mandate. “Therefore, upon consultation with the Congregation for Bishops, by our supreme apostolic authority, we appoint you as bishop of Salina, together with all the rights and obligations connected to this mission,” read Msgr. Walter Erbi, who is charge d’affaires at the apostolic nunciature to the United States. In his homily, Bishop Earl Boyea of Lansing exhorted the new bishop to continue his love and prayer for those he serves. “You will be an apostolic witness to hope through prayer,” Bishop Boyea said. “You will be an apostolic witness to love in charity. Bishop Vincke’s mother Fidelis Vincke celebrated her 92nd birthday four days after her son’s ordination. Following the homily, Bishop Vincke answered nine questions asked by the ordaining bishop, Archbishop Joseph F. Naumann of the Archdiocese of Kansas City in Kansas. He then lay prostrate on the floor while the Litany of Saints was sung. Next, Archbishop Naumann laid his hands on Bishop Vincke in the prayer of ordination. Following the archbishop, all 25 bishops and two abbots in attendance, including former Salina Bishop Edward Weisenburger, took turns laying hands on the new bishop in prayer, invoking the Holy Spirit. The Book of the Gospels was held over Bishop Vincke’s head as the prayer of consecration was prayed. Next, Archbishop Naumann anointed him with chrism. Bishop Vincke was presented with the Book of the Gospels, then Archbishop Naumann put a ring onto the finger of the new bishop, a miter on his head and handed him his crosier (staff). Both the ring and crosier have Marian themes, reflecting the bishop’s devotion to Mary. He then was led by Archbishop Naumann to the cathedra (bishop’s chair) and was seated, where each bishop and abbot present offered him the fraternal kiss of peace. Upon completion of the ordination rite, Mass proceeded, with the newly minted bishop serving as the principal celebrant. For the Liturgy of the Eucharist, Bishop Vincke was joined at the altar by all priests in attendance. During his remarks at the end of Mass, Bishop Vincke spoke of his devotion to the Blessed Mother. Yet, he first and foremost gives glory to God. Among those seated in Sacred Heart Cathedral were almost 100 family members and friends who traveled from Michigan to witness the event. Also in attendance were 50 visiting priests from the Diocese of Lansing and across the country. In addition to thanking the bishops and priests in attendance, he expressed gratitude to the permanent deacons and their wives, as well as priests from the Salina Diocese. He also acknowledged members of four religious orders who traveled to the event, a consecrated virgin from the Diocese of Lansing, the diocesan choir, musicians, staff and the Knights of Columbus.